RIT welcomes 21 freshmen through the Destler/Johnson Rochester City Scholars program Aug. 27. Last year’s class is pictured here. Rochester Institute of Technology will welcome the ninth class of Destler/Johnson Rochester City Scholars at a ceremony at 6 p.m. Monday, Aug. 27, at Liberty Hill, located at 2201 Lehigh Station Road, Henrietta. 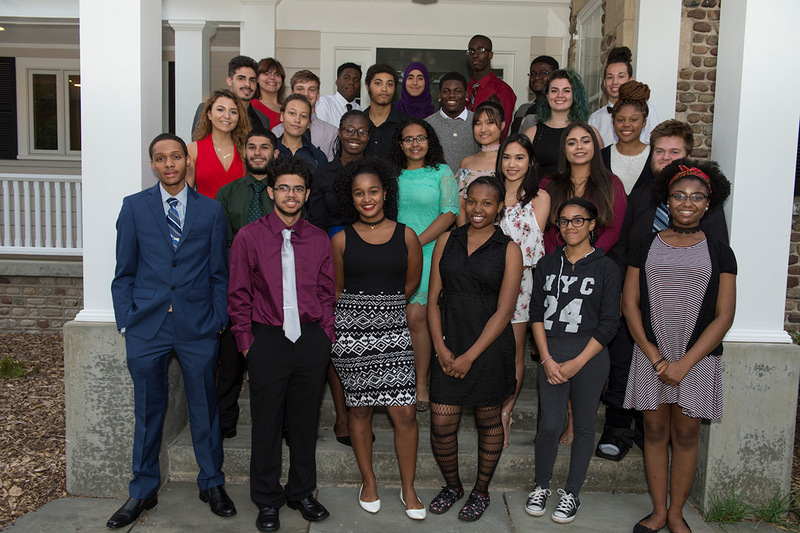 The 21 new scholars come from Rochester Prep High School, School of the Arts, Joseph C. Wilson Magnet High School, Vanguard Collegiate High School, Integrated Arts and Technology High School, Young Women’s College Prep, Edison Career and Technology High School, James Monroe High School, Leadership Academy for Young Men, World of Inquiry School No. 58, Rochester Academy Charter School and Northeast College Preparatory High School. The students will major in programs including film and animation, environmental science, accounting, computing and information technology and electrical mechanical engineering technology. More than 140 people are expected to attend the ceremony, including scholars’ family members, alumni of the program, community leaders and program supporters. RIT President David Munson will be on hand to welcome the students and deliver remarks. Recognizing the financial challenges that prevent many City of Rochester students from attending college, former RIT President Bill Destler and his spouse, Rebecca Johnson, founded the program in 2010. The program has since provided more than 200 graduates of the Rochester City School District and Rochester charter schools with the opportunity to attend RIT tuition-free. In addition to scholarship support, students receive academic and social support as they transition into the college experience. RIT recently announced a new endowed scholarship established by Mark and Maureen Davitt that will help graduates from the Rochester City School District pursue advanced degrees at RIT.